ROSELLE NJ, August 4th, 2014 Laser printer services and solution firm, announced automation that promises to push the reliability of the company's remanufactured fusers and printers to greater levels. The technology behind the dynamic interface is similar to what is used in the banking and financial industry and allows unparalleled visibility. The system records change events and graphically overlays the event on the warranty rates of the fusers and printers. This allows the company to track corrective actions and spot trends faster. The data is collected across all departments so changes to packaging, production processes and components can be better communicated and quantified. "Critical introspection is a cornerstone to Metrofuser remanufacturing, this technology will allow greater insight." said Chief Operating Officer William DeMuth "Thousands of hours in research and development have gone into the implementation of the Event Horizon system and the last obstacles to its full capabilities were cleared this summer." said DeMuth "We are excited about unleashing its full potential." 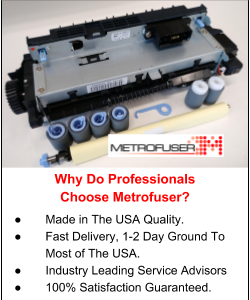 Metrofuser remanufactures and distributes laser printer parts, remanufactured printers and offers service training for HP, Lexmark and Canon brands. Multi point distribution and same day shipping allows delivery of their products in 1-2 day ground to 80% of the largest metropolitan areas. Metrofuser has been named to Inc. Magazine’s fastest growing companies five consecutive years. For more information, visit http://www.metrofuser.com.